There’s a deodorant problem in this world. First, a certain percent of the population doesn’t need to wear it, since some people carry a gene that prevents them from producing body odor, but continue to slap antiperspirant on their pits anyway, according to a study in the Journal of Investigative Dermatology. Second, the majority of men choose to mask their sweat with vaguely masculine scents like “Black Chill” and “Dark Temptation,” both of which are real Axe fragrances that don’t mean a damn thing at all. I’ve never encountered whatever Dark Temptation is in the wild—have you? But I know whiskey. I drink whiskey. I love whiskey. And I’d be happy to rub the scent of whiskey all over my smelly body if it meant we no longer had to settle for draping ourselves in pleasant nonsense like “Arctic Midnight Mystique.” (Hey, Axe: Dibs on that one.) So let’s make Pit Liquor happen, people. That’s the name of Jason and Erica Feucht’s new whiskey-based deodorant, which was born out of both necessity and curiosity. When Erica was pregnant, she couldn’t stand the “toxic slurry” of regular, chemical-laden deodorants. So she came up with a stopgap solution—hand sanitizer—which gave her husband the idea to experiment with alcoholic deodorants. 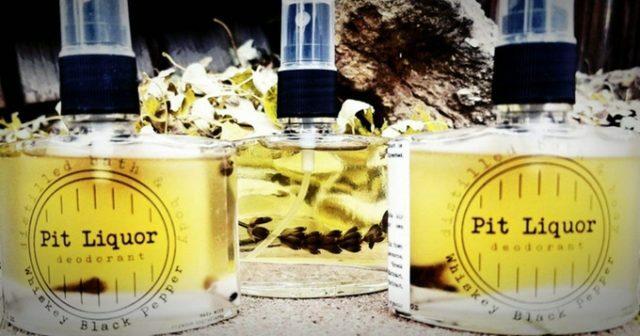 The result is an organic, locally sourced spray with edible components (lavender, slices from vanilla beans, whole cloves and peppercorns) that kills bacteria and neutralizes your pits, per the product’s Kickstarter page. The spray comes in three distinct smells: Whiskey Lavender, Whiskey Vanilla and Whiskey Black Pepper. No word yet on any roll-on vodka, but in the meantime, the Feuchts are looking for backers to help them buy 50-gallon drums of booze. Pledge $7 and you’ll get a single shot of Pit Liquor in February, or pledge $10,000 and the Colorado couple will fly you out for a weekend at Vail Ski Resort, where you’ll presumably work up enough of a sweat on the slopes that you’ll need to slather on some Pit Liquor for après ski.